This dish is a renaissance spinach dish, that is spiced and cooked in a pot or a pan. It is a simple dish that is meant to be served with fish. 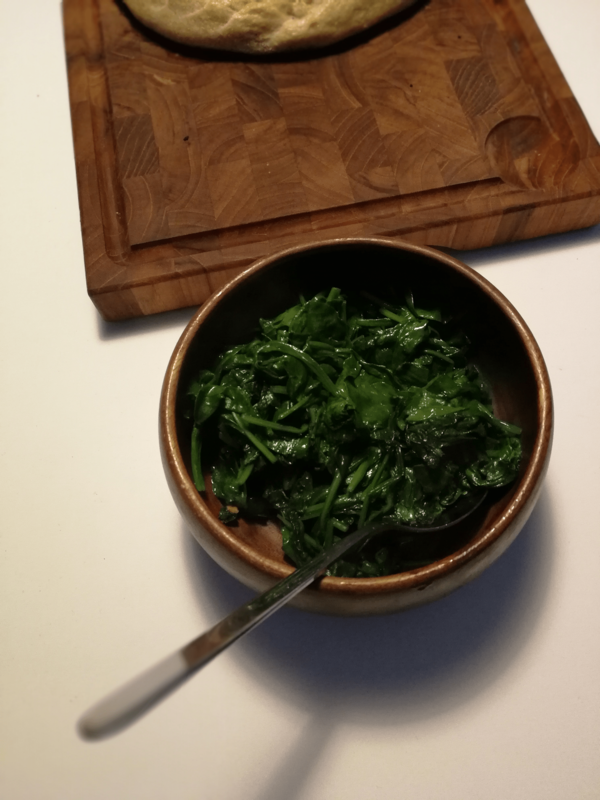 It is quite a tasty way to eat spinach. The recipe is from 1597 and is from one of the oldest cookbooks printed in Danish, though the book is originally German. It is said to be “Hungarian”, not because the recipe is from Hungary but because of the spices used. Many of the recipes in the cookbook is said to me in Hungarian, which just means spiced with onion. The recipe is from “Koge-Bog: Indeholdendis et hundrede fornødne stycker, som ere om Brygning, Bagning, Kogen…”, by Anna Weckers (Ein köstlich new Kochbuch) from 1597, printed in Danish in 1616. The cookbook is reprinted in a photographic print and is available here. Spinat paa Vngerske at koge. Tag rød Løg, skær dem smaa oc giff smaa Rusiner der iblant oc giff udi en Potte. Leg der til denne Spinat oc tryck den vel tet ned i Potten. Giff saa der ofuer helten Vand oc helten Vijneedicke oc lad det hastigelig udsiude, at der icke bliffuer formegit saad offuer. Giør det vel til met sucker, at det ey bliffuer forsøt eller surt oc giff saa derudi Bomolie (eller smør). Smag om det er til maade oc salt det til pass. Naar du vilt rette det an, saa leg om Fadet sødne Negenøyen, steegt lax eller andre Fiske. Normally I would give you a translation but my old danish is not quite up for the task – at least not right now. So I will just give you a translated modern recipe for the dish. Wash and chop the spinach. Chop the red onion. Add onion and raisins to the pot and add the spinach on top. Add the water and vinegar and cook everything until the liquid is almost gone. Add sugar and butter and cook it tough. Add salt to taste. Serve it with fried salmon or other fried fish. Source: The recipe is from "Koge-Bog: Indeholdendis et hundrede fornødne stycker, som ere om Brygning, Bagning, Kogen...", by Anna Weckers (Ein köstlich new Kochbuch) from 1597, printed in Danish in 1616.